MagniLink Student Computer/Monitor can be connected to a computer or a monitor. Use the system in a classroom for viewing materials or to record a lesson or presentation with the video recording feature. 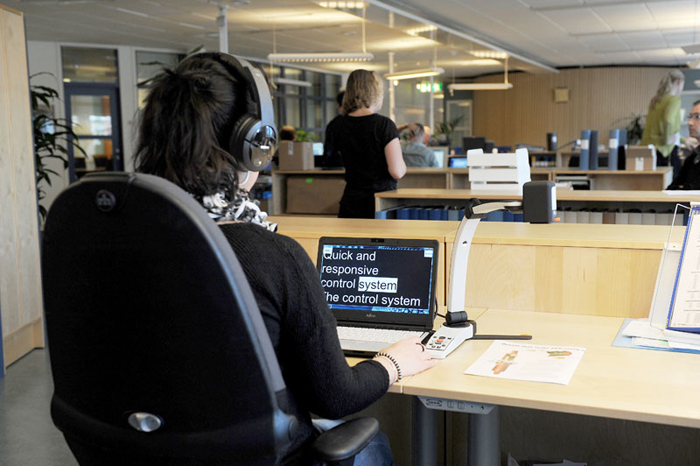 The system can also be used as a regular video magnifier at home, connected to a LVI monitor and a docking station. MagniLink Student Computer/Monitor comes with both HDMI and USB 3.0 connections and can be controlled by the integrated control box or from the computer’s keyboard. The camera is available in HD or SD resolution. The MagniLink Student Computer/Monitor used for distance viewing in classroom. The MagniLink Student Computer/Monitor is also suitable for office work. MagniLink Student is always accessible; sets-up and is ready to use in virtually seconds. Place the system to the left or the right side of the laptop - the excellent design makes it flexible and shock resistant. * PC: Microsoft® Windows® XP med SP2, Microsoft® Windows® 7 and 8 or Microsoft® Windows® Vista. * Mac: OS X v.10.6 Snow Leopard. * One integrated USB 2.0 port.